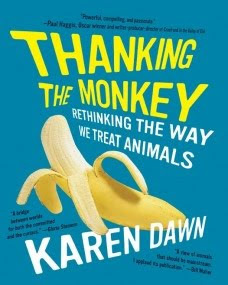 Using Amazon's "look inside" feature last night, I discovered that Karen Dawn does a fantastic job of responding to the "anti-welfare warriors" in Thanking the Monkey (pages 6-7). If I'd read that back in December when I was making similar points (e.g. here and here), I could have saved a lot of time and energy. What Karen Dawn said! Her book has graphics and endorsements to die for. I want to read more of this book. As you say, you said almost exactly the same thing. Maybe it's the zeitgeist. Hegel at times makes sense. You don't have to buy Hegel's metaphysics to see that there is a zeitgeist of sorts. Yes, almost the same thing, but she makes the case very succinctly and with perfect examples. I want to see the footnotes to this passage. Actually, I want to see the whole book. The arguments are essentially the same but her examples are succinct and on point. For example the point about beating slaves being banned prior the to abolition is more focefull than the talk about "shoes." Connecting all this to the "is veganism a religion" question I think it may work something like this: there are, as has been suggested on this blog previously, times for revolution and times for doing what you can get done. The question is: how do you know when you're at the revolution part. Passionate activists of any stripe are more inclined to see the state of the world as being in perpetual revolution. I think this is, despite how abrasive they might be, probably a necessary feature of social systems. For one thing it's simply a matter of bell curve type dynamics: someone is going to have the most extreme position on any given issue (the messiness of figuring out how deterimine what counts as "extreme" aside). This is what produces analyses like the overton window. So there is a sense in which the purists in any movement really do set a "moral baseline" that they actually try to live and to which the rest of the system can refer to. It may be annoying or perplexing for those attmepting more incremental movments towards the goal, but it (the "extremity") serves a function in the total system. We see similar dynamics in religions on the continuum from full orthodoxy to milder than mild forms of accomodating theology. I'm not sure if you ever made the point that the abolitionists' stance "reduces the animals to objects in service to abolitionist ideology." But then again, so much was written then.... I might have missed it. But I liked that point. Faust, Yes, her examples are great. 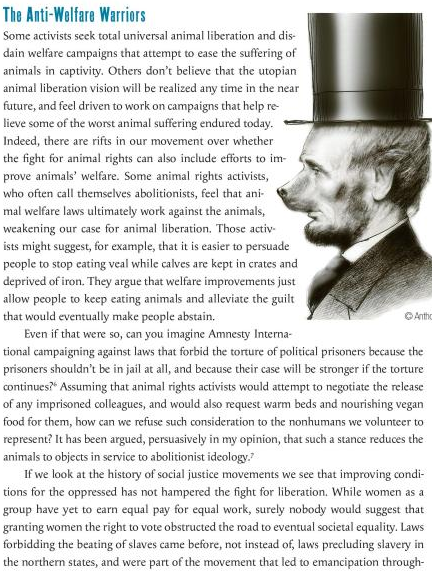 In my Animal Rights class I have always included the "abolitionist" position in the syllabus (using Tom Regan as the primary representative, but lately also Gary Francione). I think the main ideas in a rights view should be taken seriously. So--by all means, "extreme" does not mean "wrong". I have to admit it's also useful to cover a staunch rights positionbecause of an "Overton window" dynamic. With Regan or Francione style abolitionism in the picture, other views (like Singer's) start to look very, very nuanced and moderate. I spend just a little time on "anti-welfarism", which is not a necessary element of the "abolitionist" standpoint. Students universally find it unbelievable--so implausible that they are amazed it's anyone's position. Wayne, I like that point too. I think I said something like that, but again--she's so clear and succinct! She said it much better. Plus, I like her consistency point. I don't think I said that, though may have been thinking it. I feel an amazon purchase coming on...she's good! Jean, I really enjoy how the finer points are "teased out" on your blog. I skimmed over Karen Dawn's mention of the consistency theory, however only clearly understood what that means after reading one of your posts. I think veganism helps one transcend the material realm (which you discussed a few blogs back, Jean). For the rational/reasonable person veganism is a completely positve practice. But some vegan activists operate with too much emotional force, which to me might indicate some kind of psychological "issue." Melissa, Thanks for the link. There's lots of good, interesting stuff in that article! I'm glad I'm starting to discover smart responses to the "anti-welfare warriors." I have no problem with the practice of veganism--in fact, I think it's admirable and I aspire to be more vegan. I just have a problem with the contempt for everyone else of "super vegans." I think it's irrational (they don't understand the complicated psychology behind these things) and completely counterproductive. Faust: there seems to be a qualitiative difference between the pragmatists and the purists, and from what I can see of history, the purists tend to create a nightmare out of a possible utopia. From the worthy cause of giving workers a fair share of what they produced, the purists, the Bolcheviks, created dictatorship and bloodshed. The movement against the war in Viet Nam, another good cause, was derailed by the purists, the Weatherpeople, who turned pacifism into terrorism. The Palestinian people have a right to self-determination, but the purists, Hamas, have also turned that cause into terrorism. The list is long and bloody. The Puritanism of the purists is ethically different from the gradualism of the pragmatists. The quest for moral perfection almost always brings evil in its wake. Better a skeptic and a cynic and even a hypocrite than a purist, fanatic or puritan. 1. It is inevitable in any continuum that there will be extremists (the category is analytical). 2. There are useful functions offered by such extremes (the systems defines itself at least partially in terms of its extreme elements. But you are right that there are plenty of dangers in the wings. When radical elements try to take over, the destabilization can be...trouble. Non-violent extermists may be a special case though. As Sam Harris has pointed out, no matter how extreme a Jainist gets, they are not going to be a threat to you.